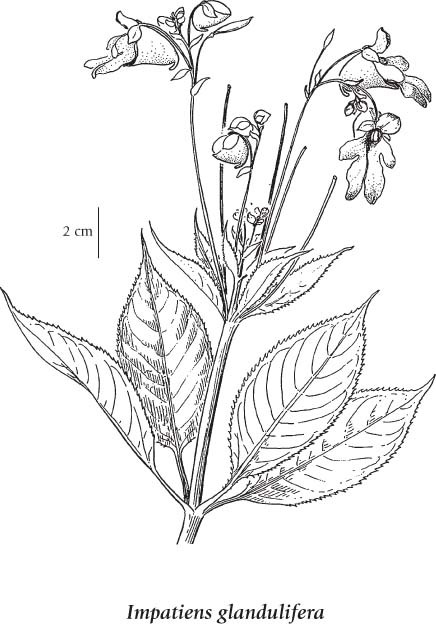 Policeman's helmet is an easily identified species of Impatiens, 0.6 to 2.0 m in height, which produces distinctive white to pink, purple-spotted flowers with short recurved spurs. Flowering occurs from July to September. It can form thick homogeneous stands in moist shady spots along creeks, riverbanks and sloughs and in open sunny ditches. It produces abundant seed in seed capsules that explode when ripe allowing near dispersal and thick growth. The earliest collection record for this species in the UBC Herbarium is 1937, when it was collected at Still Creek, BC by John Eastman. "[Policeman's helmet's] high reproductive rate, early germination, propensity for establishing thick stands, rich nectar production, hardiness, and habitat tolerance and plasticity have allowed it to spread rapidly, dominate landscapes, and compete with and displace native plant species." (Global Invasives Database 2010). Annual succulent herb; stems erect to ascending, often branched, glabrous, often purplished-tinged, 0.6-2.0 m tall. Opposite to whorled (at least some of them), stalked, egg-shaped to elliptic, sharply and closely saw-toothed, 6-15 cm long. One to several in leaf axils, whitish to red, usually purplish-spotted; sepals pouched, with a short recurved spur. Capsules, elastically dehiscent, 1.5-2.5 cm long, many-seeded. 2. Leaves alternate, coarsely saw-toothed; flowers orange or yellowish. 3. Spurs of the sepals curved or hooked. 4. Flowers more than 2 cm long, spotted, mottled or sparingly flecked. Moist to mesic streambanks, meadows, roadsides and waste places in the lowland and steppe zones; infrequent in the lower Fraser Valley and extreme SC BC; introduced from Asia. A combination of factors including a high reproductive rate, aggressive seed dispersal, early germination, and high nectar production which attracts pollinators allows this species to out-compete and displace native species. It is very attractive to pollinators (Bartomeus et al. 2010). For further information about control of this species, visit the Great Vancouver Invasive Plant Council web site. Bartomeus, Ignasi, Montserrat Vilà and Ingolf Steffan-Dewenter. 2010. Combined effects of Impatiens glandulifera invasion and landscape structure on native plant pollination. Journal of Ecology 98 (2): 440 - 450.